Nail bloggers are a crafty bunch. 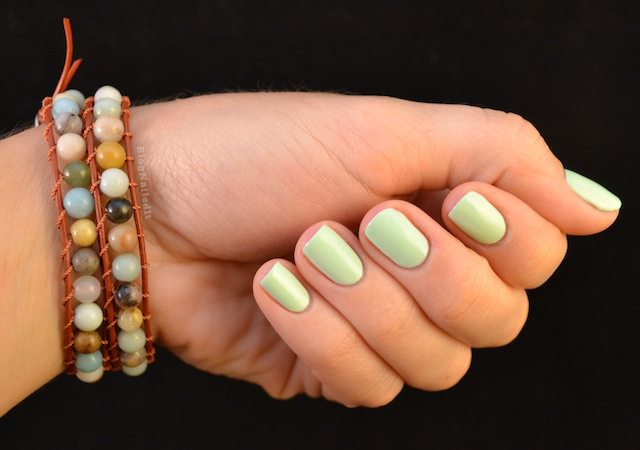 We kind of have to be to patiently sit down and craft nail designs, posts and pictures for the blog's content. You'll see baking on Rebecca Likes Nails, custom nail sets at The Nailasaurus, and nail polish jewelry at Nails by Kayla Shevonne. Is it any surprise that I too get the craft itch from time to time? The insufferable need to craft certainly isn't helped by the fact that one of my best friends is an Assistant Editor at Beading Daily. You can read some of her posts for their blog here. I finally roped her into showing me a technique for a beautiful wrap bracelet I had spotted the ladies of her office making (here). I'm tickled with the result! Chloe helped me choose the right size beads from a well-stocked local bead store. We stumbled into a truck show, where this colorful strand of turquoise and stone colored beads awaited me. I chose to pair the beads with a burnt red leather and matching thread. The bracelet took hardly any time at all to make, but the final result speaks volumes. I can't wait to start wearing it with the fall colors that will inevitabely adorn my fingers, but for tonight, I chose to keep it simple with Re-Fresh Mint (China Glaze). Thanks again for the tutorial Chloe! What kind of non-nail art do my fellow bloggers find themselves posting about? Share your other hobbies in the comments! Turned out great! I love that you used that burnt red leather! Lovely! A tutorial would be awesome (wink, wink)! I'm not a blogger, but in my free time I like to sew and paint canvases! Love the bracelet! I'm not a blogger but I enjoy making earrings, sewing quilts and doing crafts with my kidos! are you guys selling the bracelets? I am currently not selling anything like this, no. Would you be interested in buying some? If so, what price point would you be willing to buy them at? 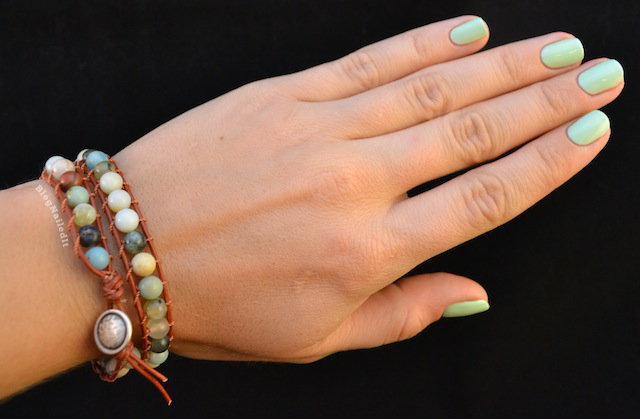 Very nice manicure and bracelet, I make the same bracelets, I've used turquoise, onyx and even silver nuggets, Love them! GORGEOUS!! I don't know what I like more, the bracelet or the nails!! Perfect combo!! I'm in love with your bracelet! You should totally do a tutorial ;) Love this!